At 3.50 pm on 14th April 1944 my grandfather Hirji Rustomji Dalal was seated in his Navy jeep next to his driver at the Dhobhi Talao junction casually smoking a cigarette on his way to Her Majesty's Docks at Lion Gate when the air quivered with a massive shockwave that blew apart the glass facade of the Metro theatre. The shockwave was followed by a tremendous noise. My grandfather looked at his driver and said, "To the docks now!". He reached a scene of utter and complete devastation. South Mumbai was overhung with clouds of black smoke. The SS Fort Striknine had just blown up in Bombay Harbour, the shock-waves were felt in Simla(!) and windows blew out of their frames in a two kilometer radius from the docks. Shrapnel from exploding ships, buildings and other ordnance flew all over the city and along with it flew bars of gold which were a part of the cargo. One of these bars flew through the sky before crashing through the roof of the bathroom of a Parsi gentleman having a bath. The gold bar slammed into his bucket of water where it sizzled for some time. I still remember his son telling me how hard he laughed to see his naked, soap covered father running out of the bathroom. He said it was worth the subsequent spanking. They recovered the charred bar and it was recognised for what it was. He returned it to the athourities, for which he received an honourary title and was known as Khan Bahadur henceforth. Later almost all the gold was recovered by the British though a few bars keep turning up every few years during the dredging of Mumbai Harbour. My mother's grand uncle Mr Sohrabji Frenchman used to work in the docks, that fateful day he had finished his shift and was almost outside the gates when he remembered he had forgotten his tiffin, he went back in and was never seen again. The family searched amongst the dead bodies stacked like cordwood in the aftermath but to no avail. I can still see the look of horror on my maternal grandfather's face as he recounted this tale to me more than 30 years later. For the next fortnight my grandfather only came home to bathe and change said my dad who had his own story to tell. A huge propeller fragment flew from the harbour over 2km away to fall in the compound of his school, St Xavier's High School, Fort. It is still there on the school campus and I I remember my dad showing it to me when i followed him to do my schooling there. I also proudly told my classmates about it and how my dad was in school when this huge chunk of iron landed there! There were many tales of great courage shown that day and in the next few days most of which were never recorded. The people of the city hid in Victoria Gardens (now the Jijamata Udyan) at Byculla, many left the city forever. Many a family was traumatised and many lost loved ones. The death toll was pegged at 1300 of which over 500 were civilians and 66 were firefighters (memorialised forever after in a memorial which stands outside Mumbai Fire Brigade HQ at Byculla even today). 14th April has been celebrated as 'Fire Services Day' in India since that day. One of the most interesting notes in the war office is one recording the amazing service of the Bhikha Behram Well near the Churchgate Station. For seven days and seven nights the docks burned and for seven days and seven nights fire tenders continuously pumped water from the well which miraculously didn't go dry. No one has still determined whether this event was an accident or sabotage. But it left an undeniable mark on Bombay for all time. My name is Pateti and I am no one's New year! Around this time of the year I begin to dread the sound of the words 'Happy Pateti' or 'Pateti Mubarak' trilling off the mouths of friends, well wishers and others. With every such occurrence something inside me cringes and dies a small death. I have even had the word mangled and voiced as Papeti! A papeti is a diminutive papeto, Gujarati for a small/baby potato! I have decided that this year I have to finally do something about it ... this just cant go on! Most non-Parsis and to my complete open-mouthed amazement even a few Parsis think that the Parsi word for New Year is Pateti. Let me lay down the law for all of you here. The correct word for New Year or New Year's day is Navroze, and the correct greeting is Navroze Mubarak. So then where does this word Pateti come from? Pateti is the last day of the Parsi year. The day before Navroze. It is not a day of celebration but a day of intense introspection and a day when you go over your deeds of the last year and repent those that you realise did not conform to the Parsi credo- Good Thoughts, Good Words, and Good Deeds. A day you make amends with your self and your Maker, and promise that you will do better in the coming year. This may be done at home or at a fire temple. Many an old school Parsi will go to the local Agiary to do this. The devout Parsi thus performs Patet on this day. He/she accepts his/her shortcomings, shows a readiness to accept the judgement for the same, and most importantly makes a resolution not to make the same mistakes in the coming year. Thus unburdened of these misdeeds you make a fresh start with the next day and the New Year - Navroze! And just like Good Friday and Moharram you don't wish someone on such a day. So this year do it right, wish your Parsi friend a Happy Navroze. Navroze Mubarak to all! And may this year bring you peace, prosperity and happiness. A lot of my friends have been asking me how its Parsi New year today when the calendrical event is supposedly still 30 days away. This post is a small attempt on my part to clear the murk. The Parsis of India are the descendants of a group of Zoroastrian refugees who fled Persia some time in the 9th century AD and took refuge on the mainland of India. The descendants of these refugees are called the Parsis and they are concentrated (today) mainly in Mumbai, Pune, Ahmedabad, Surat, Delhi and Hyderabad. Their biggest contingent of resides in Mumbai and makes up almost 70-80% of the Parsi population of India. There is also a considerable overseas diaspora. Amongst the many quirky things about this small group of (less than 50 thousand) people is the fact that they celebrate three different days of the year as their New Year Day. There are two very clear subgroups the Shehenshahis and the Kadmis (there is also a smaller group called the Faslis but more on them later). The original Zoroastrian calendar in Persia was supposedly created by their mythical king, Jamshed. He decried that the year (a solar year) would begin on the Vernal Equinox. This day was therefore called Jamshedi Navroze. On most years this day (when day and night are of equal duration) falls in the northern hemisphere on the 21st of March. On leap years it falls on the 20th. It may also (very rarely) fall on the 19th of March ... this has to do with the computed time slippage of 5 hours 49 minutes per year. Those of you who are astronomically challenged will need to ask Google to sort this out for you. The Parsis of India continue thus to celebrate the Vernal Equinox as Jamshedi Navroze (Jamshed's New Year) it is an important date in the calendar but it doesn't mark the first day of the Parsi Calender. They celebrate it as an auspicious day and because the Parsis will jump at any excuse for a celebration. The Parsi calendar is a continuation of the Sassanian Calender of Iran. The last Sassanian emperor was defeated in 642 AD by the Arabs and they installed the Hijri calender in its place. The Sassanian calender consisted of 12 months each of 30 days. To these 360 days of the year were added 5 additional days called the Gathas. This made up a 365 day year. The Persians realised the slippage and calculated that they needed to add 25 lost days each century. So they created a ceremony and a month called the Kabisa where a leap month of 30 days (according to some oral traditions every century a leap month of 25 days plus the the 5 Gathas) was added to the year. This would then sync the year with the solar rhythms. The add to the confusion the year itself was dated to the beginning of the reign of each monarch and was a Regnal year date. 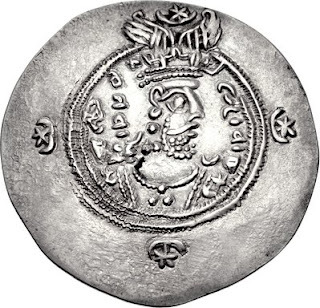 When Yezdegird Sheriyar III (the last Sassanian Emperor) was defeated at the battle of Nehavand he was in his 10th regnal Year, the calendar having commenced from the 16th of June 632 AD. This calendar is still followed in Persia and is known as the Qadmi/Qadimi/Kadmi calender. The Kabisa was never officially performed after the death of Yezdegird. The Parsis of India on the other hand have a calendar that is exactly one month out of sync with the Persian calendar. Their Navroze falls exactly one month after the Kadmi Navroze. They call their calendar the Imperial Calendar or the Shehenshahi Calendar. The suffix YZ to their year. This discrepancy was realised by them when they were confronted by it in 1720 AD when an Iranian Zoroastrian priest called Jamshed Velati traveled to India and pointed this out to them. Apparently the Ancestors of the Parsis had performed a single Kabisa and thus the calendar was out of sync by a month. Many Indian Zoroastrians thought they should follow that which was being followed in Iran and converted to this calendar the majority though refused. This led to a rift and two parallel calendars now became current. This resulted in a split in the clergy with separate fire-temples for both groups. For a some time there were no marriages between the groups though now this is no longer true. In the early 20th century Kharshedji Rustamji Cama (after whom the K R Cama Oriental Institute is named) decided to try and reform the Parsi calendars by proposing: 1. A 365 day calendar with the provisions for a leap year and 2. A commencement from the Vernal Equinox i.e. on Jamshedi Navroze. 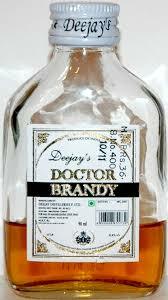 It was immediately adopted by a few Parsis but was rejected by the majority as the Orthodox priests refused to switch. Surprisingly the Iranian Government made the same changes in Iran and adopted a new calendar that starts on the the day of the Vernal Equinox! It was called the Fasli (Harvest) calendar. 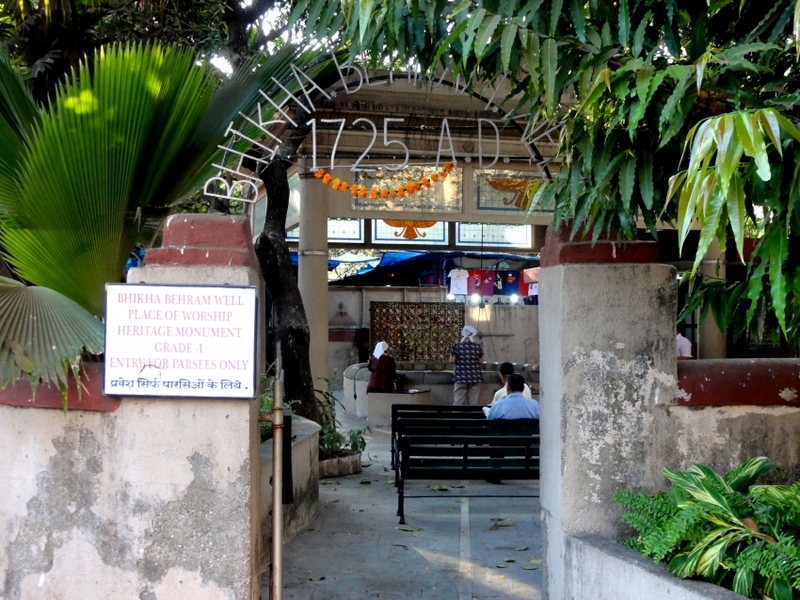 There are few adherents of the Fasli calendar and only a single fire-temple at Churchgate in Mumbai. Legend has it that the official shift to the Fasli calendar was proposed to the Mumbai Parsi Panchayet (the apex governing body of the Parsis of India) which decided to vote on it. The proposal lost out by one single vote and doomed the community to yet another calendar. Of Failed meetings and Fine Food - Lunch at Malvani Aswad. A few weeks ago an old friend asked me to do an old friend of hers a favour. What was the need of the hour was an archaeologist to speak to a group of visiting researchers. They were looking for an anthropologist but since none was available at short notice would I sub and help out? I wasn't doing much the next day so I said yes. Sent my CV in which was promptly forwarded to the researchers. The meeting was scheduled for the next afternoon at 1 pm ... at 12.30 as I was enroute I received a panicked call asking me if I would speak briefly to the leader of the research team. I said yes and there followed one of the weirdest telephone conversations of my life. It consisted of questions as to my ability to answer questions each of which was followed by the questions 1. Are you an anthropologist? and 2. Would you call yourself an anthropologist? All the routine questions got the correct answers but I replied negatively to the Anthropologist queries which were becoming very repetitive and weird. I reached the meeting place in Vile Parle E in Mumbai and was met by a very flustered friend of friend. Who apologised profusely and told me that thee meeting was scrubbed and that the research team was off to lunch. They hadn't realised that my CV didn't say anthropologist(!) and that they couldn't discuss the topic with me as their principles had specified that they were to talk to an anthropologist! I was ready to throw a fit when I realised that the lady organising this wasn't to blame and was terribly uncomfortable to boot. She apologised profusely, showed me printouts of her emails (including my CV) and an affirmative call by the team. She was almost in tears and I thought "what the hell let it go" and proceeded to do so. In an interesting twist she insisted on remunerating me in full as it wasn't my fault in any way (her words). I was tickled and decided to treat myself to lunch. As I left the building I remembered a small Malvani restaurant highly recommended by my friend, food blogger extraordinaire, Kalyan. Its a small hole in the wall joint called Malvani Aswad and the only restaurant I know that is shaped like an elongated parallelogram with a kitchen in its loft. It has no A/c and no loo but the simple (very clean) restaurant is always packed with diners. True to its reputation it was packed to the gills with about 20 people waiting to get in and another 8-10 waiting for take-aways. This is always a good sign in the food business. I was offered a plastic chair on the footpath and I sank into it and pulled out my Kindle. 15 mins later I was asked to place my order and told my table would be ready in 10 minutes and so would my lunch. i decided to go with the Kombdi Masala served with Vade. 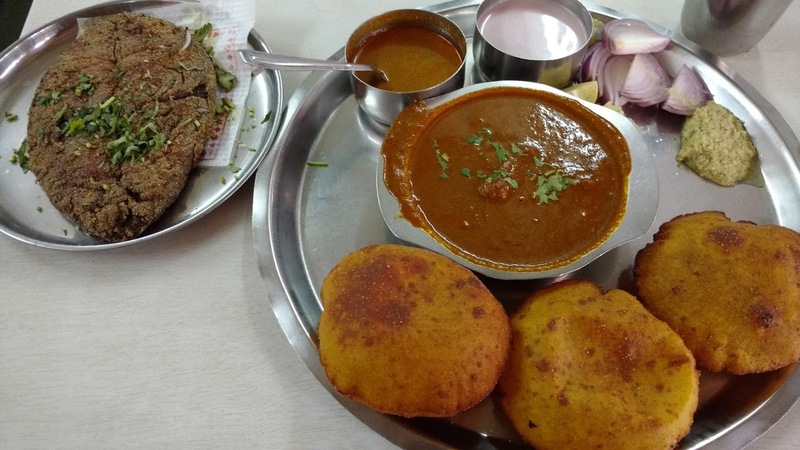 In other words a chicken in a thick yellow brown dessicated coconut gravy redolent with roasted spices served with deep fried puffed breads called Vade. Vade are a bit like puris but thicker and coarser giving you a lot of texture as you eat them. And just to be a bit of a glutton I asked for a side of fried Surmai (Seer). Ten minutes later I was shown to my table and a minute later my lunch was before me. The Chicken was everything I hoped it would be and the Vade were delightfully crunchy. The fish (a large slice) was fresh, succulent and well coated with Malvani spices. A small bowl of a thinner curry (with the teaspoon in it) and another of Sol Kadhi (Coconut milk and Kokum extract), lime wedges, onions, a very nice and super fresh chutney also came with my lunch. The food was spicy yet not chili hot and the Sol Kadhi was there to soothe the mouth in between bites. It was one of the best Malvani meals I had had in quite a few months.I heartily recommend this restaurant. thank you Kalyan for directing my footsteps and stomach this-a-way. But I wasn't yet finished with lunch. Sitting outside I'd spied an ice-cream freezer loaded to the gills with a variety of things amongst which was a blast from the past. 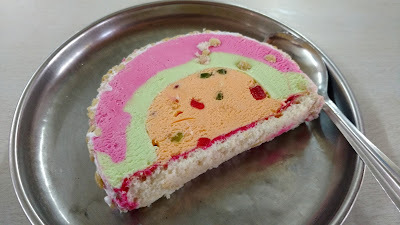 An ice-cream from my childhood days called a Cassata. This was a slice cut from a hemisphere or roll of multiple ice-creams (traditionally strawberry, pista and tutti-frutti) spread over a base of cake and topped with nuts. I hadn't eaten one of these in many years and I just had to cap this awesomely great lunch with an epic dessert and I asked the gent at the ice-cream freezer to do the honours. Some time later sated and very happy I wobbled out of Malvani Aswad with a second helping of chicken for R's dinner (and as a peace offering for having gone here without her). 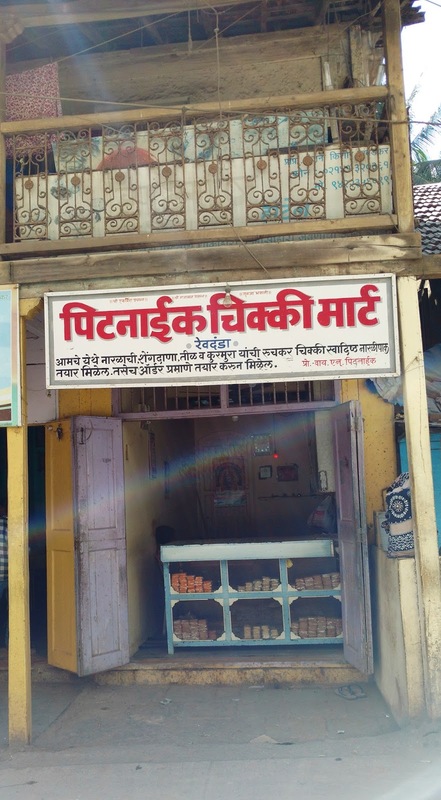 Wandering through the by-lanes of towns and villages in the Konkan during Archaeological Explorations one comes across some truly unique and beautiful gems. These are often not just palaces or archaeological monuments but small quaint pieces of the heritage of the Konkan, its people and its foods. One such gem I stumbled across in the small town of Revdanda (17 km south of Alibaug), erstwhile Portuguese fortress and home to one of the oldest Bene Israeli synagogues whilst doing a quick field trip in search of Bene Israeli remains with my wife Rhea and my student Raamesh. Searching for the synagogue we parked at the mouth of the lane leading to it and as we stepped out from the car in front of us was a chikki shop with a name I had never encountered before. Intrigued I went in to find an old gentleman selling squares of chikki and fudge. 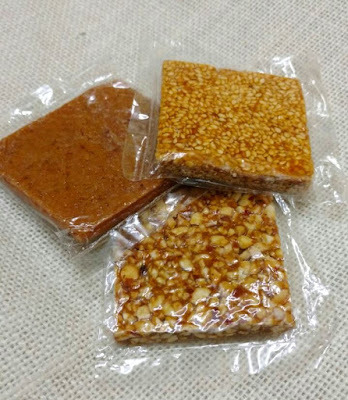 Chikki is a very Indian version of brittle, the main difference is that whilst brittle has a few nuts or butterscotch in it chikki is mainly nuts held together with a caramelised jaggery. Whilst the most common chikki has either whole or crushed peanuts in it there are many other variants. Common variants include roasted gram (chana), shredded coconut (khopra), amaranth (rajgira) and toasted sesame seeds (til). Pitnaik's had crushed peanut chikki, sesame seed chikki, shredded coconut chikki and squares of coconut fudge (khopra paak) white and a ghastly orange. You can see some of these squares in the pic below, each square was priced at the princely sum of Rs 5/- (less than 8 cents US!). There was just one packet of the uncoloured fudge which I promptly ate thus no pic of the same.I refused to buy the violently coloured one. I have been to Revdanda probably 20 times if not more I wonder how I missed this little shop all these years. Had it not been for our quest for the Bene Israeli synagogue we'd never have found this gem. The chikkis were really nice and I will drop by next time I am there and recommend the same to all of you travelling the Konkan, these little businesses need all the help they can get. Revdanda Fort is a true wonder of colonial fortifications with hidden facets peeping out from under creepers and vines and there is an absolutely fabulous beach hiding here. Across the Kundalika River is the Fort of Korlai which gaurds the mouth to the river alongside the Revdanda Fort and it has spectacular views of the sea and Revdanda. Revdanda lies on the route from Alibaug to Murud and makes for a great stopover. 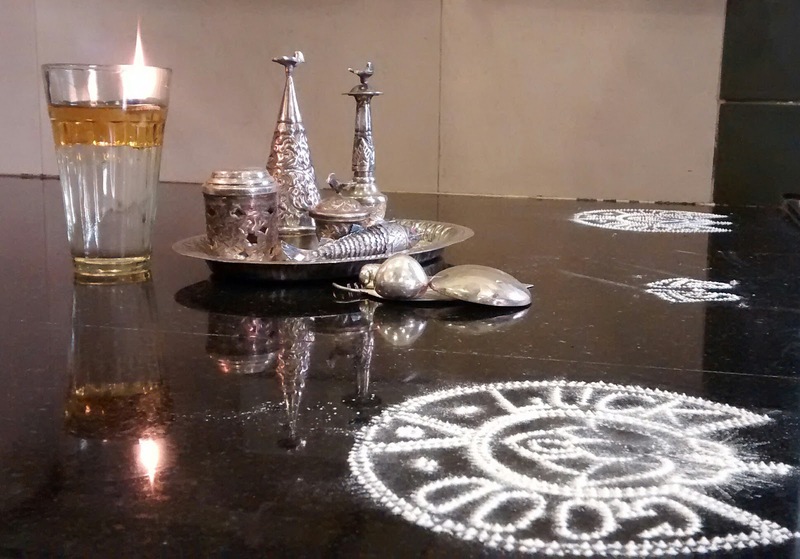 Parvati Kadam was affectionately known as my mother's dowry. As a very young bride she came down to Mumbai to live with her (much older) husband who worked in the BPT. She was trained by my maternal grandmother in her Bandra kitchen ... on wood, coal, kerosene wick, kerosene pump and gas stoves ... a skill set almost completely missing today. She would cook, clean and feed my gran's entire household and was soon a master of Parsi cuisine. When my Mum married my Dad and moved to VT in 1968 she came along to help Mum and stayed on for the next 25 years. She was almost a second mum to me, she doted on me and packed my lunch and on rare days even came over to drop me to school. But this is not about how she took care of me but about how she ultimately took care of her own demons. Very often she would come home to work in the mornings with a swollen face, black-eye or bruised arms. When I asked her she would say she had fallen at home. My mum used to get incredibly worked up and would tell her not to put up with this but to make a Police complaint and that mum would stand by her. Mr Kadam a by and large nice gent used to get a bit drunk once in a while and on those days he'd come home and toss her around. After much screaming by my mum she'd quietly reply that it was okay after all he was her 'maalak' (Marathi term for husband whose literal translation is owner)! This would incense my mother even more. Over the years the beatings seemed to lessen especially as Mum had started her catering business (KFD Caterers) and Parvati was her strong right arm and Chief Cook. She was bringing home the bacon in sizable chunks. Then one day Mr Kadam came to see my mum he must have been in his early 60s and he looked much the worse for the wear ... swollen faced he requested my mother to speak to Parvati. When my mother asked him to clarify he said she had been coming home and once a while whaling the tar out of him! He was most embarrassed at what the neighbours were saying about a wife beating her husband. The back story to this was that as she got a little longer in the tooth and the business scaled up there would often be late night after late night with catering for 500 to a 1000 persons each day. At the end of the day there would be a tired lot of kitchen staff that would send out for something to fortify themselves with and the tipple of choice was Doctor Brandy. A couple of nips and she would go home by cab (courtesy Mum) ... and on arrival sometimes give it back to her husband with full interest. My mother was least sympathetic and chortled with glee ... when she had finished laughing she told him it was simply payback for all he had done and that as a good Indian he should think of this as his karma. On this 'Women's Day' I cant think of a better memory. Thank you Parvati for all your love and care.